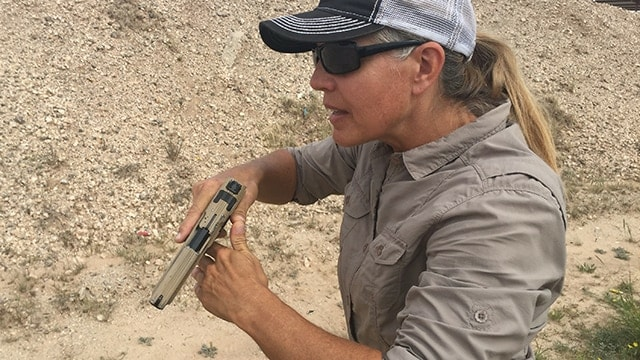 Safe rangecraft includes knowing how to handle your unholstered pistol on the firing line. Beyond the range, competent use of ready positions enhances the gun-wielding person’s ability to navigate crowded or unknown situations. 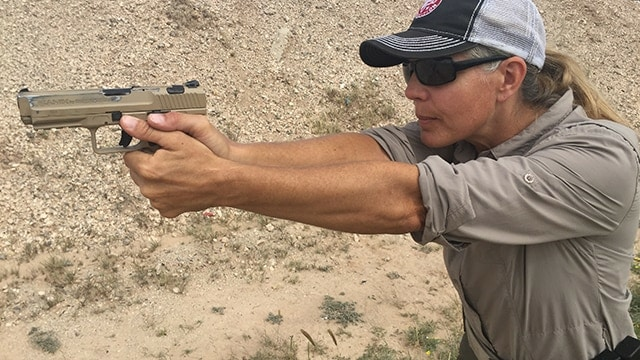 This article covers three so-called ready positions that serve to keep shooters and those around them safe, as well as keeping the firearm poised for quick deployment. The names of ready positions used here are arbitrary; they’re the ones I use. Other instructors may call them other names. What’s important is mastery of their use. They’re presented here in the order that they’d be used in situations from relaxed to high intensity, with the understanding that context may dictate otherwise. In these ready positions, the trigger finger should be kept straight and planted on the frame of the pistol. With both hands on the gun in a firing grip, (see trigger finger advisory above), simply rest the upper arms on the chest. This is a relaxed position from which the gun can still be brought into action quickly. Low ready is first ready position I teach even brand-new shooters. It precludes the possibility of that most common of shooting injuries, a round through the foot. With both hands on the gun, the shooter’s mind is better focused on the firearm and the lower limbs stay in the clear. It’s also a no-strain position in which to take a break. Maintaining the firing grip and keeping the muzzle pointed in the direction of the target or threat, bend the elbows and draw the gun near the chest. Keep elbows resting against the sides of the body. This position is comparatively faster than low ready in terms of re-acquiring a sight picture. It is truly a “ready” posture in that firing can be done from there if the attacker closes distance quickly to within bad-breath distance. 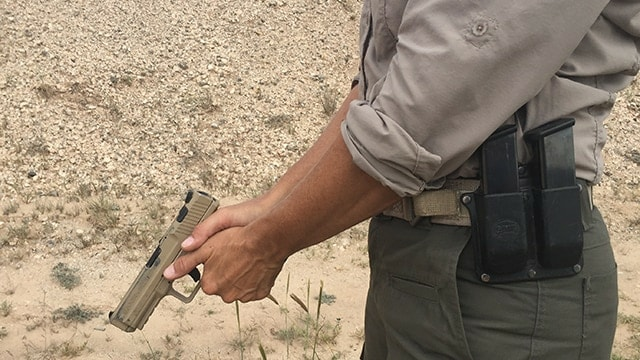 Malfunctions in a semiauto are entirely possible in such a scenario, unless the wrists are firmly locked and the gun is at least far enough away from the shooter’s torso to allow the slide to cycle completely. I have come to like compressed ready as my scan-and-assess position, one in which I can turn my gaze 360 degrees and know the gun is secure at my chest and at less risk of being grabbed in a real-world setting. Sul, pronounced like “pool” with an s, means “south” in Portuguese. That’s useful to know inasmuch as it’s a reminder of where the muzzle should be pointing when this ready position is used—straight down. Getting into sul is done by rotating the support thumb against the firing hand thumb as the elbows bend and draw the handgun to the chest. Some operators put it against the abdomen. It really doesn’t matter; I prefer the chest as this is my go-to position for being ready to deploy the gun at a moment’s notice, and the motion required to do that from the chest is minimal. 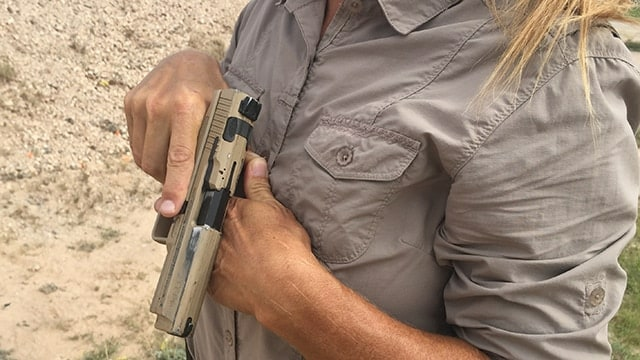 This is the only position here in which firing grip is broken to be in the ready position. In sul, the support hand rests against the body while the firing hand maintains a firing grip, with the wrist angled so the muzzle points straight down. The most common mistakes in sul are not pointing the muzzle straight down, which creates the error and danger of muzzling one’s own knee or foot. The other is sticking the elbows out. Elbows should be pressed against the sides. 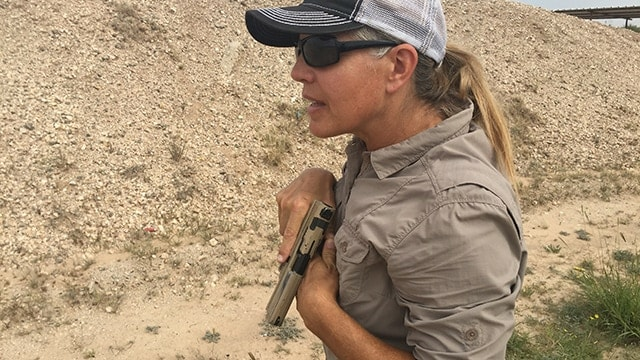 Sul is a great skill for anyone who carries a gun for public or self-protection. 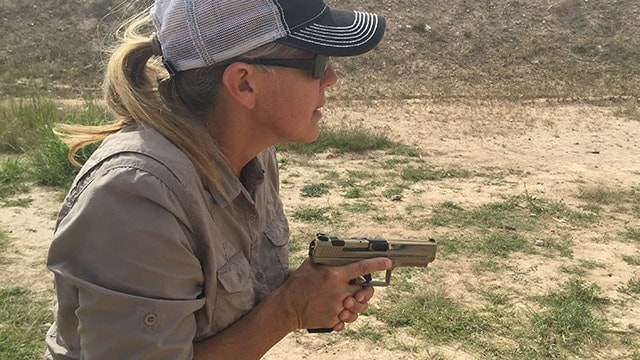 It keeps the muzzle in a safe direction, keeps the gun as secure and theft-resistant as possible when in hand, is discreet and less detectable in environments where the sight of a gun could cause new problems, and is extremely fast to get back into firing position with a little practice. These ready positions and make them part of your practice. You will be safer and more competent, on the range and off, having become handy with them. As always, the rules of firearm safety apply here, and neither Guns.com nor I bear responsibility for any unintended outcomes of your practice.